In May 1937 around 4000 children arrived by boat at Southampton. They were refugees from the Basque area of Spain. On July 10th 1937, 56 of those children came to Caerleon. Why did they come to Britain? Why did they come to Caerleon? Where did they live in Caerleon? What did they think of life in Wales? What happened to them later? Even if you have already heard the story of the Basque refugee children in Caerleon there is always more to reflect on and learn – and commemorate. Hywel Davies – author of ‘Fleeing Franco – How Wales gave shelter to refugee children from the Basque Country during the Spanish Civil War’. Carmen Kilner – Secretary of The Association for the UK Basque Children, who will also talk about the current work of the Association. 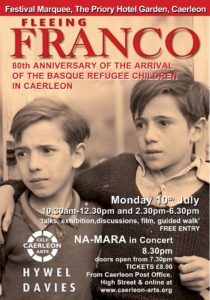 Gail Giles – author of ‘From Bilbao to Caerleon: The Basque Child Refugees of 1937’. Copies of Gail Giles’s pamphlet and a range of items from the National Association will be available to buy in the Marquee. 12.30pm Break for lunch – The Priory restaurant and a range of other local eating opportunities. 2.30pm Eddie Butler (author, journalist, TV presenter and rugby commentator) – a talk about his 2012 BBC Wales film, ‘Wales and the Basque Refugees: The Children’s Stories’. 3.30pm A short guided walk around Caerleon village to see where the children lived. 5.00pm A panel discussion on current issues related to child refugees in Wales with John Griffiths AM, chair of the Welsh Assembly Committee which has produced the recent report on refugees in Wales, entitled ‘I Used to be Someone’ and representatives of local support groups for child refugees.